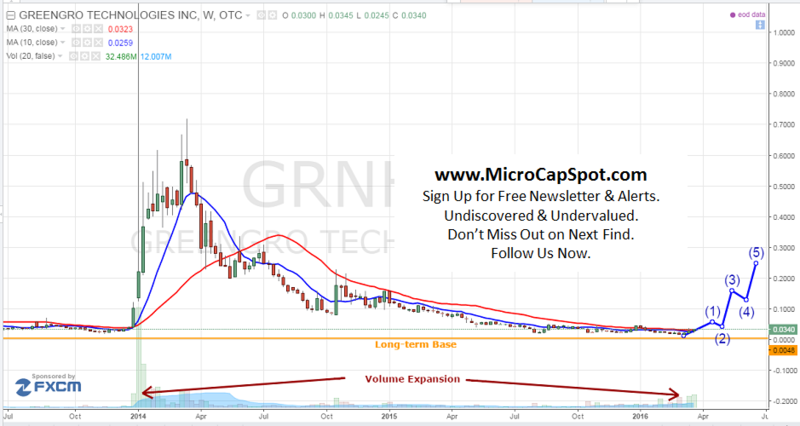 Greengro Technologies Inc (OTCMKTS:GRNH) investors have reason to be excited with the recent developments and announcements. The stock has almost doubled since bouncing off its 52-week low. The stock surged on Thursday locking in gains of almost 30% on impressive volume. Volume hit over 12 million shares trading hands compared to its daily average volume. Over the last few weeks volume has expanded significantly. GRNH is currently trading at a $3.6 million market valuation. The company had a record breaking quarter and is in the early stages of turning around. Revenues will likely continue to expand and year over year comparable will likely be impressive. This is an exciting story that is about to take off. Stay tuned for more details.